We are located in the foot hills on the eastern side of the Blue Ridge Mountains of Virginia. We have pets regularly visiting us from DC, Maryland and throughout Virginia. If you like to ride in the country you will enjoy the drive. Your pets will appreciate you going the distance. It is hard to find our small town on the map but if you draw a triangle between Sperryville, Warrenton and Culpeper we are located towards the center and about a half hour drive from these three towns. Do watch the mileage as listed below because you will feel like you have missed us when you have not gone far enough. It is a pretty drive and easier than it may sound your first time out. Take Rout 3 West From Fredericksburg to Culpeper and follow Culpeper directions. Take Route 522 North towards Sperryville. After you pass Blackwater creek but before you get to a town called Woodville. At Scrabble, turn right on Scrabble Road also known as Route 626. Stay as stright as you can and don't turn on gravel roads. We are 3 point 1 miles on your right. You will see The Pet Tailor sign on Scrabble Road and the Victory Lane sign. Follow the Pet Tailor signs down the driveway to our office. Take route 231 North towards Sperryville and turn right onto Route 522 South and follow Sperryville directions. Take Route 522 South past Woodville and look on your Left for the Mount Lebanon church sign at Scrabble. Turn left on Scrabble Road also called Route 626. Stay as stright as you can and do not turn on gravel roads. We are 3 point 1 miles down on the right. You will see The Pet Tailor sign on Scrabble Road and Victory Lane sign. Follow the Pet Tailor signs down the driveway to our office. From Route 211, turn onto Route 642. Stay on this road for 5 Miles all the way to the stop sign. Turn right onto Route 729, go a mile down the road and continue straight onto route 618. Go 2 point 9 miles and turn right onto Hope Hill Road - also still Rt 618 at this point. (If you like to count roads it will be the second State Road to your right) Once you turn, go as straight as you can for a winding country road. The route numbers and the road names will change but do not make any more turns, we are exactly 2 point 2 miles on your left. You will see The Pet Tailor sign and Victory Lane sign. Follow the Pet Tailor signs down the driveway to our office. Take Route 522 South to Flint Hill. Turn Left onto route 729 and cross route 211 at Ben Venue. Go 5 Miles to the stop sign and turn Right onto Route 618. Go 2 point 9 miles and turn right on Hope Hill Road. Go as stright as you can for 2 point 2 miles and don't turn onto gravel roads. Make a left turn by the Victory Lane sign and follow Pet Tailor signs to the office. Take interstate 66 West, past Manassas and exit at the Gainesville Route 29 South exit and go South towards Warrenton. Take the first exit to Warrenton and Luray. Turn right onto Route 211 West. Now follow directions from Warrenton. Take Route 211 West to Amissville and turn left on Route 642. Stay on this road for 5 Miles all the way to the stop sign. Turn right onto Route 729, go a mile down the road and continue straight getting off of route 729 and onto route 618. Go 2 point 9 miles and turn right onto Hope Hill Road - still Rt 618 at this point. (If you like to count roads it will be the second State Road to your right) Once you turn, go as straight as you can for a winding country road. The route numbers and the road names will change but do not make any more turns, we are exactly 2 point 2 miles on your left. You will see The Pet Tailor sign and Victory Lane sign. Follow the Pet Tailor signs down the driveway to our office. From Jeffersonton’s Ma and Pa Store on route 229-take route 640 beside the store. You have two choices of how to go. If you do not want to use a gravel road go all the way down and turn right on route 729. Go straight onto route 618 where route 729 takes a sharp right turn towards Ben Venue. Look at your mileage and go 2 point 9 miles and turn right. (If you like to count roads it will be the second State Road to your right) The Road you will be turning onto is called Hope Hill Road but is also still route 618 at this point. Once you turn, go as straight as you can for a winding country road. The Route numbers and the Road names will change but do not make any more turns, we are exactly 2 point 2 miles on your left. You will see The Pet Tailor sign and Victory Lane sign. Follow the Pet Tailor signs down the driveway to the office. 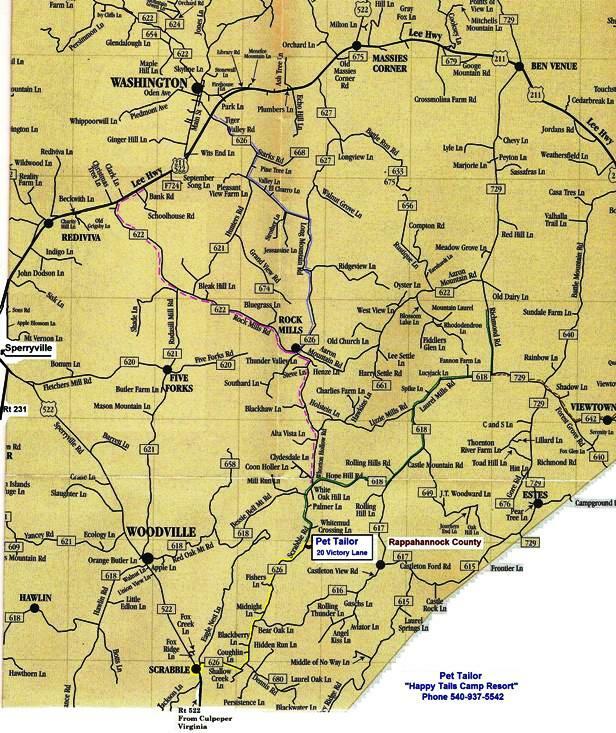 For the adventurous or those that don’t mind gravel roads, from route 640 you can turn right on Doc’s Road, at the stop sign turn left onto route 642, at the next stop sign, turn right on route 729 and go straight onto route 618 at the bottom of the hill where 729 makes a right turn and go straight getting onto route 618. Look at your mileage and go 2 point 9 miles and turn right. (If you like to count roads it will be the second State Road to your right) The Road you will be turning onto is Hope Hill Road and is still Route 618 at this point. Once you turn, go as straight as you can for a winding country road. The Route numbers and the Road names will change but do not make any more turns, we are exactly 2 point 2 miles on your left. You will see The Pet Tailor sign and Victory Lane sign. Follow the signs down the driveway to the office. Take Route 729 also known as Richmond Highway South towards Culpeper. Turn Right onto Castleton Ford Road. Go to the "T" intersection and stop sign; turn right onto Castleton View Road. Take the next left onto Hope Hill Rd. We are 2 point 2 miles on left. You will see The Pet Tailor sign and Victory Lane sign.